SUMMARY: An Iranian man’s wife leaves him to care for their daughter and his aging father. The woman he hires to help brings a new set of problems that may just ruin his family and his good name. DETAILS: A Separation is an Iranian film (The Separation of Nader and Simin) that won Best Foreign Language Film at the 2012 Academy Awards. 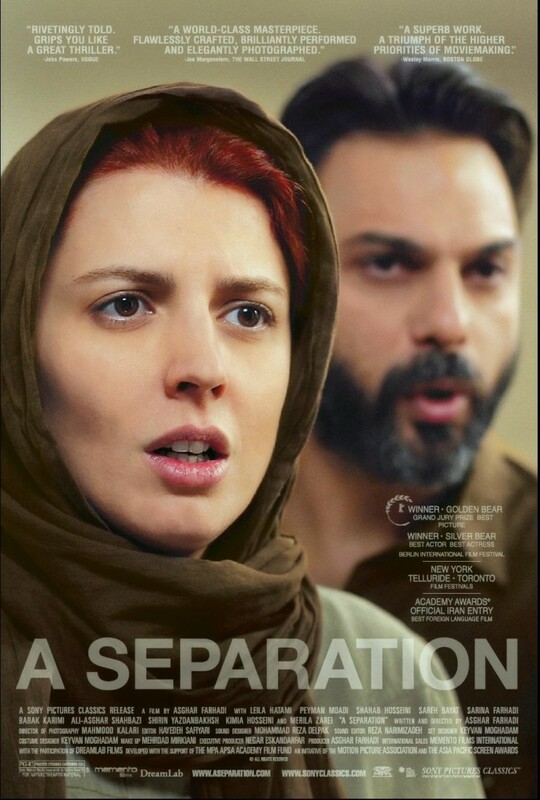 Also nominated for Best Original Screenplay, A Separation tells the story of the tragic breakup of an Iranian middle class couple, Nader (Peyman Moaadi) and Simin (Leila Hatami), and explores the consequences of their decision that includes lies, deceit, miscarriage/murder, child custody, and ultimately a quest for justice. The story begins with Simin attempting to divorce her husband who refuses to leave the country with her in order to stay and care for his aging father who suffers with Alzheimer’s. Their separation forces Nader to find a caregiver for his father and this is where their troubles begin. Nader hires a woman from a lower class who desperately needs work, but who (due to the intimate nature of care-giving involved) is forced to lie about her employment. A Separation beautifully explores the issues of class, marriage, parental care, sin, love, and the tragedy of a couple splitting up. The film is a slow and steady, beautifully shot, dramatic piece that I highly recommend for anyone desiring a glimpse into modern day Islamic life. The aging, nearly silent, grandfather in the film is wonderfully played by Ali-Asghar Shahbazi whose actions, mannerisms, and portrayal of a man with Alzheimers should have earned him a nomination for Best Actor in a Supporting Role. This film proves that the power of storytelling is truly a universal gift.